Hotel Valuation Edition - English - Are hotel return spreads too high? Are hotel return spreads too high? Since the start of the most recent recession a decade ago, a conundrum has emerged that affects owners and managers of hotel assets, and their lenders and investors. Although average real estate capitalization rates in the United States have been falling for the past eight years, capitalization rates for hotels have remained steady and, in some cases, have even increased since 2010. This is unexpected and puzzling: we would expect hotel cap rates to roughly match other real estate cap rates. If cap rates for all real estate classes are falling, why aren’t the hotel cap rates following in lock-step? Here, we explore this conundrum and make the case that hotel cap rates may actually have been too low at the beginning of this decade and are only now normalizing. As shown in Figure 1, Moody’s Seasoned AAA Bond Returns® (AAA) are lower post-recession (after 2010) than they were pre-recession (before 2008). 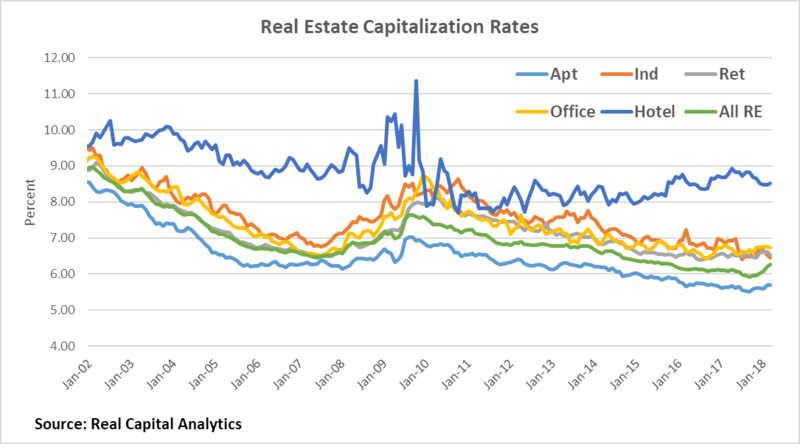 Capitalization rates for all real estate are also lower post-recession than pre-recession, even though the post-recession spread between all real estate and the AAA has widened. Spread is an economic performance metric that is used to measure the difference between the real rate of return on an investment and the rate of inflation in the economy. In addition, we can see that capitalization rates for hotels are lower post-recession than pre-recession, but it is not clear that the pre- and post-recession spread for hotels to all real estate has changed. 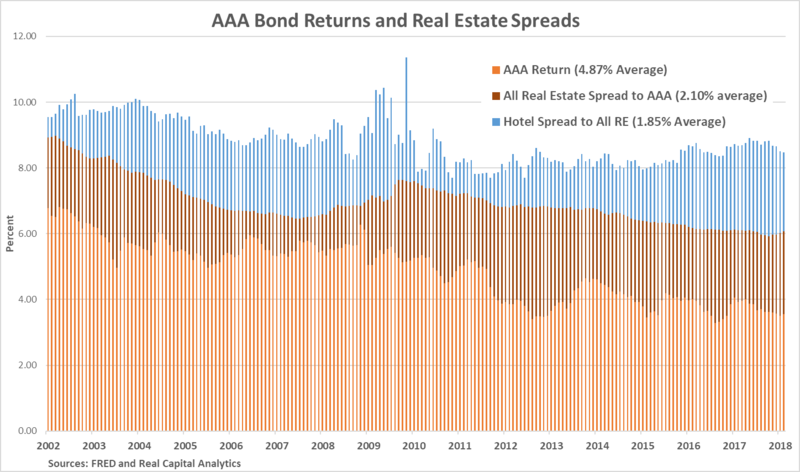 Figure 1 – AAA Bond Returns and Real Estate Spreads. 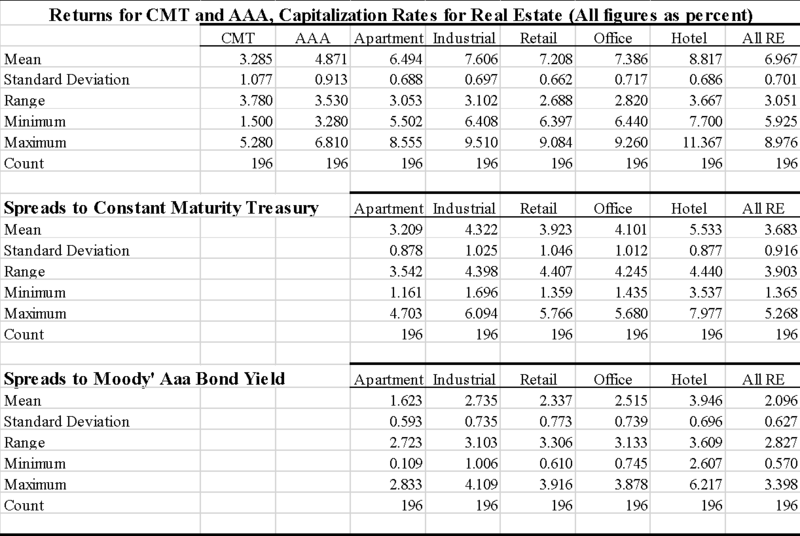 The top of the curve is the Real Capital Analytics (RCA) capitalization rate for hotels, the middle curve is the RCA average capitalization rate for all real estate, and the bottom curve is the Moody’s Seasoned AAA Corporate Bond Yield®. Capitalization rates are used to evaluate real estate investments. They consider a property’s net operating income compared to current market value or sales price, and show the potential rate of return on the real estate investment. By tracking U.S. capitalization rates for each of the five major property types and the average capitalization rate for all real estate (Figure 2), it becomes clear that capitalization rates for all real estate except hotels began an extended period of compression in the post-recession period, beginning in late-2009 and early 2010, and leading to the conundrum we are experiencing today. Figure 3 provides additional visual evidence of the difference in real estate spreads compared to hotel spreads. The “all real estate” spread to AAA bonds (blue line) is clearly higher in the post-recession period than the pre-recession period. The post-recessionary period “all real estate” spread to AAA appears to be relatively steady, averaging 2.5 percent. At the same time, the hotel spread to “all real estate” clearly shows that the spread declined dramatically in the period immediately following the September 2008 shocks, but has been steadily widening, from roughly 1.0 percent in 2010/2011 to more than 2.5 percent in late-2016 and through 2017, although the spread has recently abated. Note that one of the reasons hotel cap rates spiked so dramatically in 2009 (Figure 2) is that the rates were still being calculated based on historical 2008 financials. However, investors were seeing sharp financial declines in weekly and monthly data throughout 2009; these caused values to drop, which drove the cap rates up. Once 2009 and 2010 financials became available as the basis for cap-rate calculations, investors saw incomes were improving in the preliminary 2010 and 2011 data. Because value perceptions were increasing despite the temporarily very low historical financials, this caused cap rates to drop sharply. While it is easy to dismiss this volatility as noise, hotel investors need information about the magnitude and stability of NOI drops, stabilization and growth to accurately calibrate their offers. It takes at least two quarters for the changes to become clear. 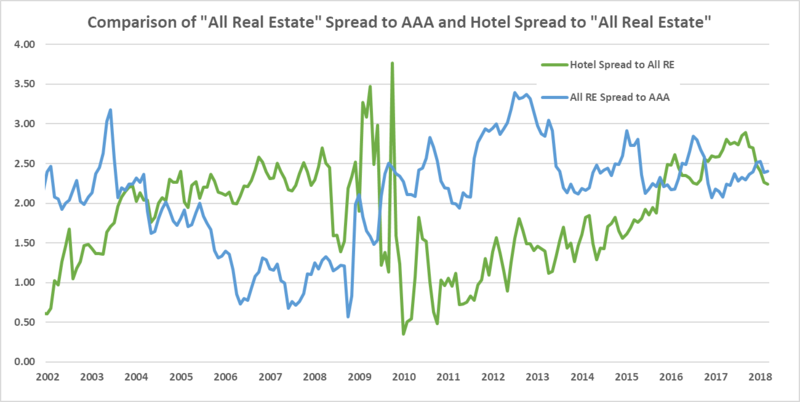 Although real estate spreads reset immediately after the recession to a new level, hotel to “all real estate” spreads appear to have lagged behind and have only approached pre-recessionary levels since 2016. By examining the underlying data and the relationships for the 2002–2018 period and the pre-recessionary and post-recessionary periods, we explore how and why the current conundrum emerged. The time period for these data is limited to the availability of the hotel data series, which started in December 2001. When we explore the descriptive statistics for bond returns and capitalization rates (see Table 1), interesting patterns begin to emerge. For example, both the 10-year Constant Maturity Treasury (CMT) and the Moody’s AAA Seasoned Bond Yield® (AAA) bond series are more volatile than the real estate capitalization rates, exhibiting a higher standard deviation, during the time period in question. As well, the standard deviation of real estate capitalization rates is a remarkably narrow range, from +/- 0.662 percent for retail property to +/- 0.717 percent for office property; hotel capitalization rates are less volatile than the average “all real estate” standard deviation. The real estate spread averages 3.683 percent above the CMT and 2.096 percent above the AAA yield. Hotels have the highest spread, at 5.533 percent above the CMT and 3.964 percent above the AAA yield. There is less than a one-in-a-million chance that the hotel spread is not statistically different from the all real estate spread and from the other property type spreads. The volatility, as expressed by standard deviations, of the AAA spreads is lower than the CMT spreads; for example, the “all real estate” AAA spread volatility is +/- 0.626 percent and the CMT spread volatility is +/- 0.916 percent. Since the CMT spread is the sum of the AAA and the real estate spread, the proper way to interpret real estate spread volatility is to examine their spread in the AAA bond, not the CMT. Table 1. Returns for CMT and AAA, capitalization rates for real estate. The descriptive statistics for bond returns and capitalization rates, the real estate spreads to the 10-year Constant Maturity Treasury (CMT) return, and the real estate spreads to the Moody’s AAA Seasoned Bond Yield® (AAA) for the entire 2002–2018 time period. Other patterns emerge from the data when we examine the real estate spreads more closely (Table 2). For example, all real estate classes show significant increases in their Sharpe ratios in the post-recessionary period compared to the pre-recessionary period. A Sharpe ratio is the average return earned in excess of the risk-free rate per unit of volatility or total risk. The increase seen in Table 2 can be characterized by a doubling of the Sharpe ratios for all property types with the exception of lodging. The spread for all property types increased from the pre- to post-recessionary periods (see Table 2, bottom panel). This shows that investors demanded higher returns to compensate them for the risk of investing in real estate in the post-recessionary period. The difference is statistically significant (p < 0.007 or better) for “all real estate” and all property types other than hotels and is highly significant (p < .00000001) for hotels. It is clear that hotels have the highest risk-adjusted return, as indicated by the Sharpe ratios in Table 2. The hotel Sharpe ratio is 8.066 for the entire time period and is even higher in the pre- and post-recessionary periods, at 10.471 and 13.151, respectively. Table 2. Comparison of pre-recession and post-recession real estate spreads. The real estate spreads for the sample, broken into pre-recession and post-recession time periods. Data from the period September 2008–July 2009 are omitted to eliminate the impact of the recessionary shocks for the period immediately following the initial shocks of September 2008. Here, we see the first evidence that hotels are being treated differently in the pre- and post-recessionary period. While the Sharpe ratio for hotels is 2.8 times the average real estate Sharpe ratio in the pre-recessionary period (10.471 versus 3.773), it is only 1.5 times the average Sharpe ratio in the post-recessionary period. In addition, the bottom panel in Table 2 shows that the change in the hotel spread from the pre-recessionary to post-recessionary period is less than the “all real estate” and other property types. The pre-recession difference between hotel spreads and “all real estate” spreads was 1.96 percent. The difference was only 1.70 percent for the post-recessionary period. The difference is the same (0.26 percent less) for both the CMT and AAA spreads and is highly statistically significant (p < 0.00125), suggesting that investors had already priced much of the riskiness of hotels into the capitalization rates. Table 3 shows clear differences between hotel spreads and other property types. 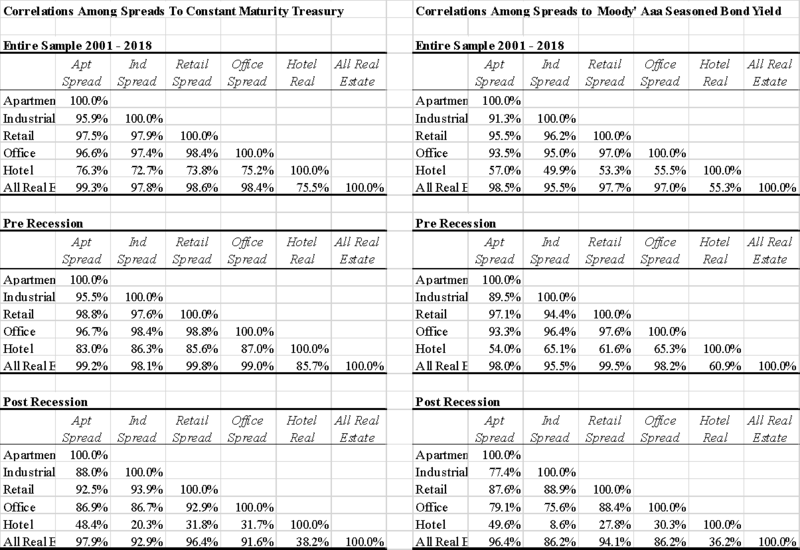 The bottom row of each of the three panels indicates the correlation between “all real estate” and the individual property types. These correlations are consistently above 90 percent, with the only exceptions being hotels and a post-recession industrial 86.2 percent spread to AAA. Hotel spread to “all real estate” spread correlations are not only consistently lower than other property types, these correlations became smaller in the post-recessionary period. Although not the focus of this article, this fact indicates that hotels have a diversification benefit within a larger real estate portfolio. Table 3. Comparison of pre-recession and post-recession real estate spread correlations. Clear differences emerge between hotel spreads and other property types. It appears that investors’ post-recessionary “flight to quality” occurred as expected but affected hotels differently from than other real estate property types. Consistent with expectations, the yields on less risky assets dropped as demand for them increased. Investors were willing to hold CMT and AAA bonds for lower yields in the post-recession period than during the pre-recession period. In addition, the spread needed to own risky assets such as real estate increased dramatically, jumping most in the months following the recessionary shocks. This relationship did not hold for hotels, however. Hotel real estate spreads exhibited a smaller jump in required yield compared to other real estate and appears to have ramped up over time rather than simply jumped from pre- to post-recessionary states. Attributing the slow “ramp up” in the spread between hotels and “all real estate” to the declining trajectory of hotel cash flow growth in the post-recessionary period seems to explain the conundrum we started with. It may also help to explain why hotel capitalization rates have remained steady over the past eight years while all other real estate capitalization rates have declined. Given the behavior of hotel cap rate spreads increasing as the cycle matures, they may be a good leading indicator for a narrowing of the spread between “all real estate” and the AAA. If this cycle behaves like the previous one, there may be room for compression of the “all real estate” spreads to AAA as the cycle matures, mitigating worry about cap rate increases linked to increases in AAA bond yields. As long as “all real estate” spreads start to compress as we reach the end of the cycle, real estate cap rates are likely to hold relatively steady instead of increasing in the face of rising AAA yields. Professor Jan A. deRoos, PhD, is the HVS Professor of Hotel Finance and Real Estate and an associate professor at the Cornell University School of Hotel Administration. On the faculty of the School of Hotel Administration since 1988, deRoos has devoted his career to studying hospitality real estate, with a focus on the valuation, financing, development, and operation of lodging, timeshare, and restaurant assets. A founding director of the Center for Real Estate Finance and founder of the undergraduate Real Estate Minor at Cornell University, deRoos teaches courses in the School of Hotel Administration undergraduate and graduate degree programs, teaches extensively in the Executive Education programs, and has developed an online professional certificate in hotel real estate investments and asset management.